Let’s learn a Simple Sponging Technique. Why sponging? Because it is the easiest ( and least expensive) faux finish, but done right, this is one of the most sophisticated faux finishes. Perfect project for DIY decorators! Subtle mottled finishes like these create an excelent background for stencils, especially damask stencils! The look resembles aged parchment, or very subtle limestone or granite look. To create this simple mottled sponged background, you’ll need 2 (or 3) flat latex paint colors, chip brush and a sponge. Here I am using just 2 colors: Benjamin Moore 1069 and Navajo White, both in flat. (By the way, this is one of the most beautiful subtle beige combo’s we’ve discovered that just seem to work in almost any room). About sponges: sponge has to be soft and have natural looking texture. 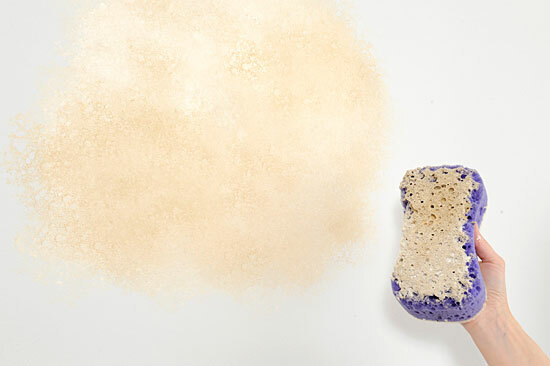 Use a natural sea sponge or a utility sponge with the right texture. If you have a utility sponge, you’ll need to pluck off the edges of the sponge to break the straight lines. Dry sea sponges are usually very stiff, so you’ll need to moisten your sea sponge before stenciling to bring back it’s softness. Just make sure to wring out as much water as possible. Synthetic sponges stay soft when dry, so you don’t have to pre-moist them. Ready to sponge? We need to first mask out all the trim, ceilings and base boards with 2″ blue painter’s tape. Press your tape hard to the surface ( we call it “burnish” the tape), because you want to ensure very tight seal so the paint will not seep under the tape. Stir your paints well. Apply both colors to the sponge with a chip brush. Here I’m lazily dipping the same brush into both cans, instead of getting a small tray and pour both colors in it, or at least just having a separate brush for 1069. Unless you know that you’re going use up all your paints on your sponging project, I would not dip the same brush into different colors, because it actually slightly alters them. Since I want my sponging be “on the lighter side”, I applied more white on the sponge than beige. Well, essentially it’s exactly what it is: you softly hit or dab the wall with your sponge, rotating your wrist with each dab. Rotating of your wrist with each dab is important to avoid identical sponge texture imprints in your finish which happen if you keep the same wrist position as you dab. When you rotate your wrist while sponging, you get most organic, natural look to your sponging. As you dab and pounce, the 2 colors are starting to blend beautifully on the wall surface. Dab and “mush” it for a little while, but don’t indulge for too long and as soon as you like your sponging look, move on to a next spot. I usually work in 2’x2′ area before moving on. 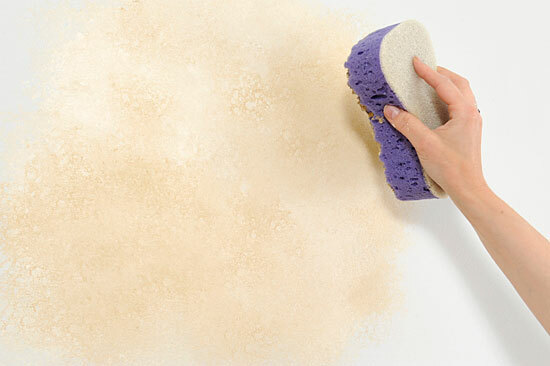 Re-load your sponge with paint often to get good thick paint coverage on the wall. You don’t want any translucency here, it’s a totally opaque flat finish. My sponge here definitely needs more paint! Comparing to other faux finishes, sponging goes on very quickly. As you get a hand of it, it gets even quicker. This forgiving finish blends with itself so well that you don’t have to worry about dry overlap marks between spots. You can come later and correct areas by lightly pouncing more of a desired color. We absolutely love this faux finish! It’s perfect for walls and looks fantastic on the ceiling. Easy to live with, easy to touch-up, easy to stencil on! To lighten the finish, add more white paint to your sponge, and to darken add more darker color. A hint: latex paint always dries a bit darker, so what may look like “too light” will become more dark and dramatic as it dries. Oh, and don’t worry if your sponging looks a touch “rough” here and there. 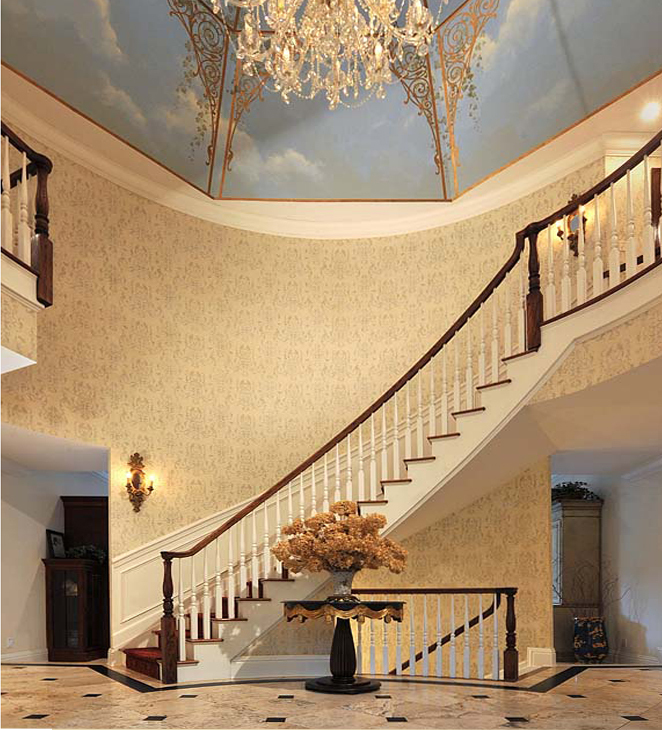 As a background for damask stencil, it wouldn’t matter if it was a touch dramatic. The stencil pattern will miraculously disguise all the imperfections in the background sponging. In fact, if your sponged background is too even, it is not so good because it will look more like flat paint under the stenciled pattern rather than a faux finish. If you want to use this finish on it’s own without further stenciling, then you’ll need to work more on it’s blending and “composition”. Instead of creating round “polka dot” shapes with your sponge go for more organic, or “continental”, shapes with your finish. Spend a little more time blending the colors so the final result is beautiful and smooth. 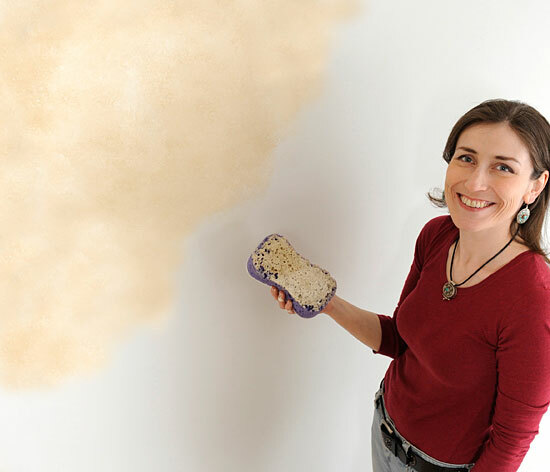 Work in small 2×2′ sections and keep sponging until all wall surfaces are done. For edges and corners use a chip brush with both colors on it. Simply stipple and dab with the brush right into the corner or edge to blend the colors together. This sponged faux finish is great on it’s own, or as a perfect background for stencil pattern and ornament. Here, a simple sponging or red and black latex paint produced this beautiful burgundy backdrop for the damask pattern. And here we sponged an entire grand foyer and then stenciled in it damask Birds of Paradise. 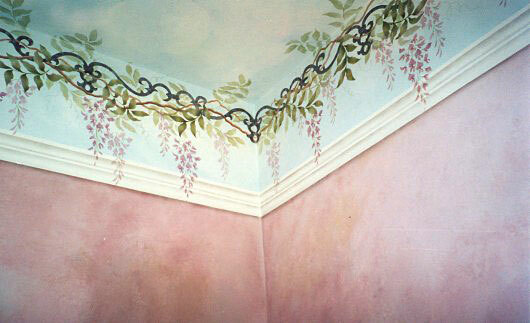 We also painted the sky and the golden trellis on the ceiling. So you can do a very modest or a very large project in this versatile and beautiful faux finish. 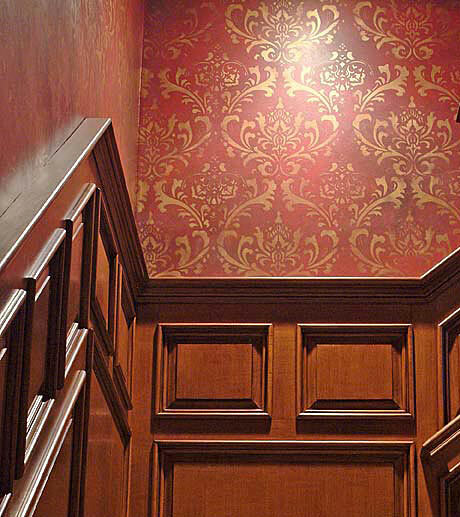 Stay tuned as we’re moving to the next topic: Damask stenciling! Purple: A Color Trend of the Future! Our Beehives get the “Craft Stencil Treatment”!